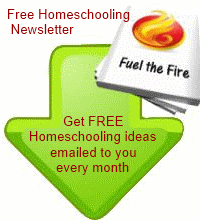 Homeschool Science can be really fun. Did you know that different chemicals produce different colored flames? This easy pine cone experiment shows you the different reactions caused by different chemicals (and tells you why!). 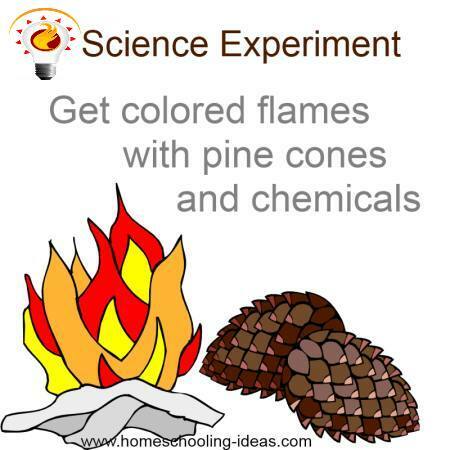 By soaking pine cones in different solutions, and then burning them - you will see different colored flames. 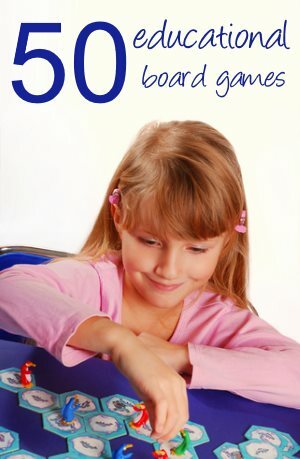 This would be a great Fall activity! Divide the pinecones depending how many chemical elements you have. Next dissolve the chemical element in the water and add the pinecones. You need to leave them to soak for several hours but preferably overnight. The pinecones need to be submerged - if you are having trouble, try putting them in a mesh bag in the water, and placing rocks on top. 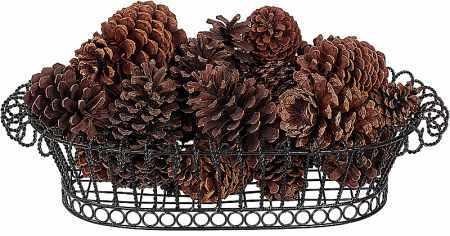 After they have soaked, remove the pinecones from the water with tongs, and let them dry. We normally place them on newspapers (be careful where you dry them as they may stain some surfaces). You need to let them dry for about 3 days before you use them. When you burn them, the pinecones will give off different colored flames. They are safe to burn in your fireplace (although I would avoid mixing the cones), or build a bonfire outside. Potasium Chloride (in the UK this is Lo-Salt). Burns violet. Magnesium Sulfate (Epsom Salts). This burns white. Boric Acid (Borax). This burns blue-green. Note: In the UK you can buy Borax at the chemist. There are other chemicals you can burn. You may be able to get these at a garden center or drugstore, or you may need to find a chemical supply company. Why do chemicals burn with different colors? Ok! Each chemical element has electrons in different energy states around an atom. When heated, energy is absorbed causing the electron to become excited, but unstable. When the electron returns to its lower energy state (ie, as it cools at the top of the flame) the energy is released in the form of a photon(light). The energy of the photon determines the wavelength or color. Ta Da!! That what comes of being married to an (ex) Physics Teacher!! CAUTION: Supervise this activity with care. This experiment takes a bit of effort - but the pine cones are very pretty to burn afterwards. If you would like to try another chemistry project, then how about learning how to smelt metals in a kiln.